Aluminum roof racks as one kind vehicle roof racks are widely used in SUV, MPV etc, which be fixed on the roof for holding big luggage, bicycle, boat etc. The aluminum vehicle roof rack structure consist: aluminum alloy die casting mount seat, longitudinal & transverse bars made from aluminum extruction profiles, rubber / plastic sound insulation pad. As aluminum roof rack need bear heavy weight, it must be fixed by nuts to keep whole structure stable. 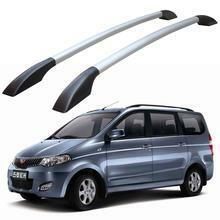 Another kind roof racks are made by plastic, they are only for decoration. This kind rack can not bear heavy weight, damaged easily.